Madrid, Spain’s lively and beautiful capital city, is the perfect location for a city break. It has everything! Well, except beaches, but that’s not essential for a quick culture filled weekend in a new city. Traveling to Madrid we were literally popping with excitement. When people from the UK travel to Spain it is typically for a holiday in the Costa del Sol or Canary Islands, and when people visit a city it is normally Barcelona. So we really didn’t know what to expect! Having lived in Malaga for 6 weeks before traveling to Barcelona and Madrid, we really had experienced all sides of Spain before reaching it’s Capital. And boy, did it live up to its name! My favorite thing about the city was the people. I’d heard that Madrid was considered Europe’s most passionate city and being there, I understood why. When the evening came around bars were full and music was playing, life was coursing through the streets. Madrid for me felt like a very open city. I got the impression that people lived by the notion that ‘if you’re in Madrid, you’re from Madrid’ and this made making friends super easy. What surprised me most about Madrid is that it didn’t feel like a city at all. With it’s beautiful buildings intertwined with elegant boulevards and vast green parks, I felt completely beguiled by the diverse landscapes all found in one place. This made it pretty hard on planning an itinerary but brought so much variety to the weekend. 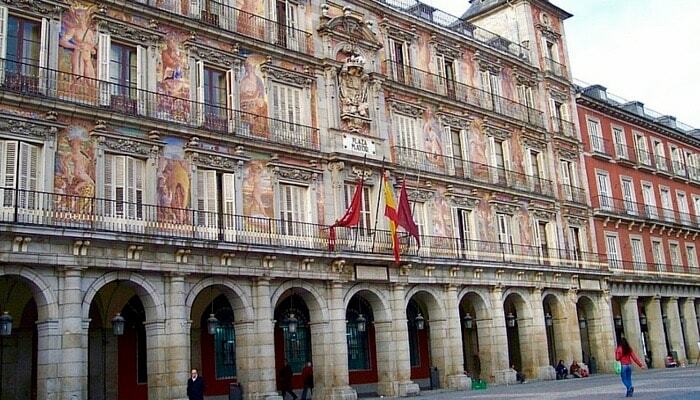 Coined as the most famous square in Madrid, Plaza Mayor (‘The Main Square’) is enclosed by stunning three-story residential buildings with grand arch entrances and the huge, colourful Casa de la Panadería (Bakery House) dominating one side. I’ll put my hand up and say I had never heard of this square (shocker considering my ‘extensive’ history knowledge) but after a free walking tour, we learned so much about its history and significance to Spain. Standing in the exact square where there would have been markets, bullfights and public executions of prisoners and heretics during the Spanish Inquisition was quite surreal. It is really worth a visit, if not to learn about the place, to gawk at its wonder and wander around the old traditional shops and cafes under its porticoes. Oh, and it’s the perfect place to start exploring from as you can always make your way back! 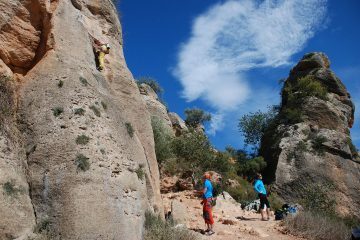 Editor’s Note: Planning a trip to Spain? Take a look at our Spain Travel Guide and Europe Packing List to make sure you don’t miss anything! I was crazy excited to see an original flamenco show in the heart of Madrid and it was what I was most looking forward to (sad or cool? You decide). 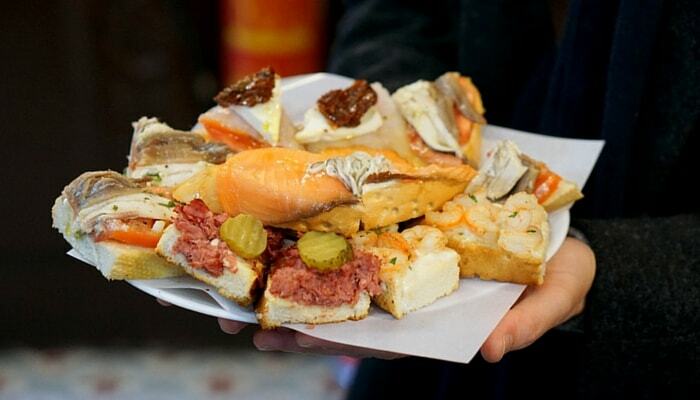 When I came across this Tapas & Flamenco Tour with Devour Spain I just had to do it. Amazing food and the passion of flamenco? Sign me up! I’m really glad we did it too as it didn’t feel like a tour, more like an authentic Spanish night out with friends. Friends you literally just met but friends nonetheless. In our intimate group of five (including the tour guide), we started our evening off with a short walking tour before our first stop. Insider Tip: The more napkins on the floor the better the place is! So when in doubt, check the floors! Nowadays, that rule usually just applies to hole in the wall, family run places. We enjoyed our first taste of ‘bar hopping’ in Spain. Our next stop? To sample Spanish wine paired with the best-cured hams and cheese. Wow! After being in Spain for 7 weeks already, I knew how popular ham was here and I thought I’d had more than enough of it. How wrong was I! This ham was so tender and flavorful, I left this place with mixed feelings – had people been giving me tourist ham instead? – and a new appreciation for their love of the meat. Recommendation for the future guys, always order Iberico ham! Editor’s Note: If you’re interested in taking cooking classes in Madrid, check out the classes listed above and learn how to cook the most amazing delicacies that Spain can offer. Now it was time for the highlight of the night! 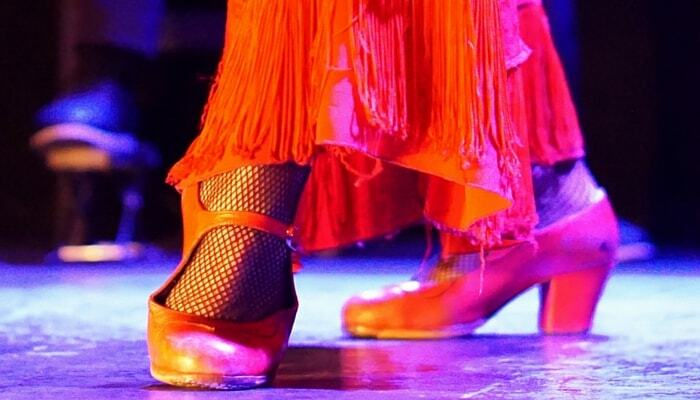 Settling into our front row seats in an intimate bar, we experienced a true flamenco dance like it is meant to be seen. Watching the emotion of the dance together with the singing, guitar playing, hand clapping and finger snapping was something special and was completely different to the romanticized version of flamenco that we see today. One important thing I noticed is that no one was clapping when they were dancing. Turns out it was because the dancers set the rhythm they want to be played by clapping (they actually have lessons in how to clap. Seriously). So no matter how much you want to get your jig on when you’re watching, wait till the end of a dance! After an emotionally exhausting and remarkable show, we finished the night off with a tapas meal together at Casa del Abuelo. The food and conversation was great, and everyone had gained a new found appreciation for Spanish culture. 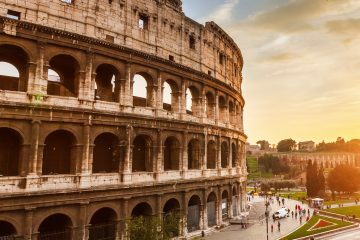 A perfect way to end this ‘walking tour meets food tastings and an evening out with friends’ package. 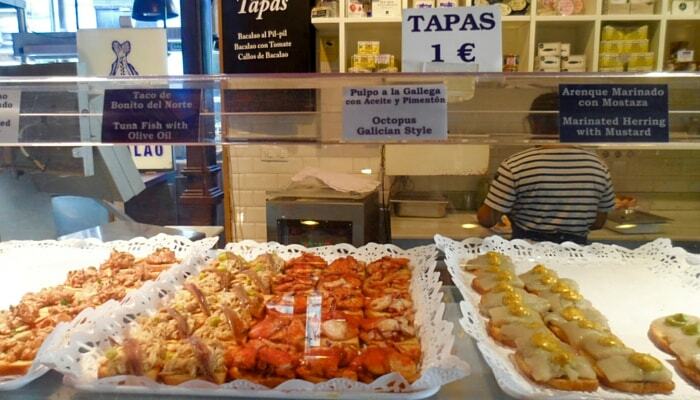 Check out the Devour Spain website to see all the Devour Madrid Tours they offer. 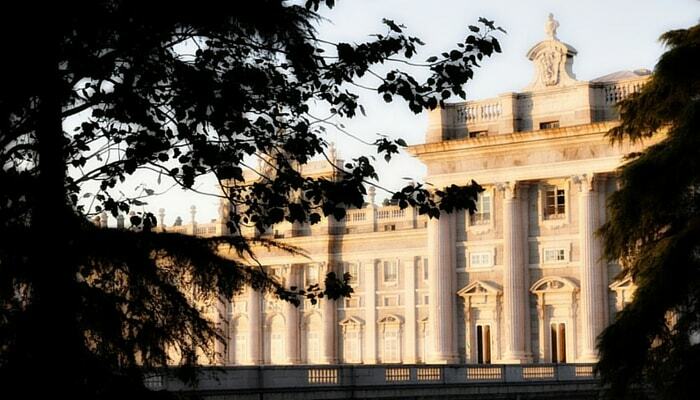 The official residence of the Spanish Royal Family, The Palacio Real de Madrid stands proudly in all its pristine, ivory glory in the Plaza de Oriente. It’s a magnificent building and definitely worth a walk around to see it from all angles, as you can only appreciate its sheer size (eight floors and over 3,000 rooms) from its gardens. If you have time to spare, seek shade and relax in the Campo del Moro Gardens or Sabatini Gardens. They are so beautiful and quiet, it feels like you are far away from the city. Before you leave, make sure you’ve seen the neo-classical Almundera Cathedral that faces the left side of the palace. It’s interior is actually neo-gothic, unlike the outside which had to be plainer to not ‘outshine’ the Royal Palace! The Museo del Prado is the main Spanish national art museum, as well as one of the most visited sites in the world as the ‘greatest museum of art’ (so basically its a really big deal). It holds the world’s finest collections of Spanish and European art dating from the 12th century to the early 19th century. If you’re not a fan of art it is still a beautiful building to go and see. 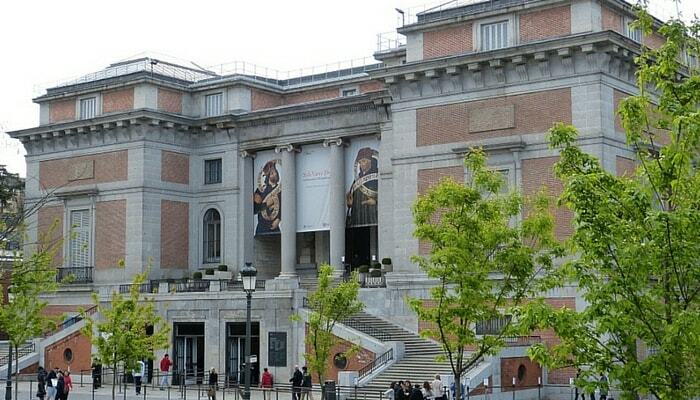 If you’re not a fan of classical art, the Reina Sofia is a better choice for contemporary art lovers! The Estanque del Retiro (“Retiro Pond”) – this is a large artificial pond where you can rent rowing boats! On one side there is a huge semi-circular colonnade with monuments of King Alfonso XII and an equestrian statue of the monarch on top. The Santiago Bernabéu Stadium – if you’re a football fan then head to see the stadium in all it’s glory. You can take a tour of the stadium’s best bits from the presidential box to the players’ changing rooms for €20 ($22 USD). 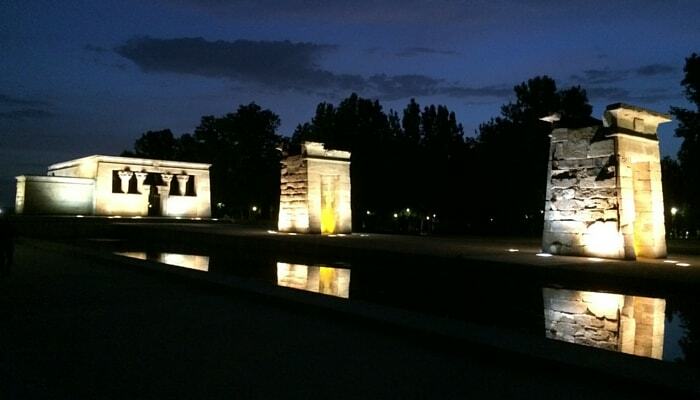 Temple of Debod – this ancient Egyptian shrine was donated to Spain as a sign of gratitude for providing help to Egypt. We recommend going here in the night to see the sunset (9pm) as the temple looks more striking lit up. 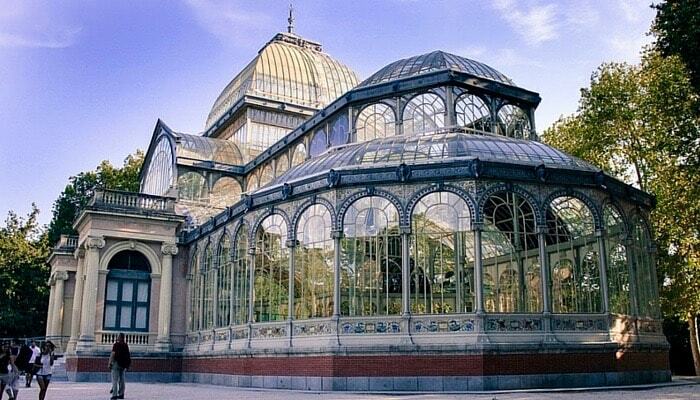 The Madrid Zoo Aquarium – if you have more time it is definitely worth a visit to the Zoo! It costs €22.50 ($25 USD) for an adult and they have three Pandas. What more could you want? Use Madrid as a base to visit surrounding cities! 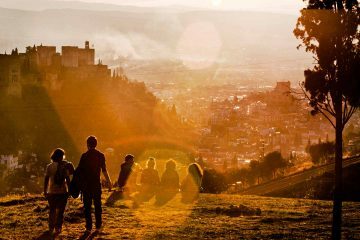 – Madrid has great transport links, so if you are there for longer than a weekend you should take advantage of the train and a spend a day in Ávila, Segovia, Saragoza or even Salamanca if you have time. We personally went to Spain’s previous capital city, Toledo, an old and beautiful walled city with prominent moorish influence. Scattered with a mix of medieval Arab, Jewish and Christian monuments, it was worth walking around and just admiring the evolution of the city’s history. You seriously only need a half a day though, the city is tiny! 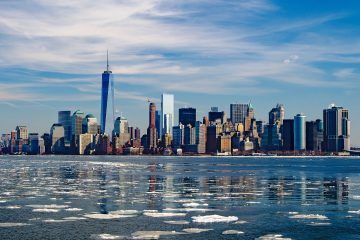 If you are more of the adventurous, outdoorsy type, take a look at these epic adventure activities like rock climbing, kayaking, or even hot air balooning. From renting an apartment with AirBnb (click here to get $45 free Airbnb credit) in Malaga and couch surfing in Barcelona, we decided to finish off our trip with a hostel in the center of Madrid and we definitely got more than we bargained for! Initially just wanting a room to dump our stuff and sleep in we actually ended up staying at OK Hostel, a really modern and hotel-esque hostel, which we spent more time at just because it was so nice. The rooms were minimalist and nicely furnished with everything you would want from a room plus good free WI-FI, score! Although the rooms were lovely, the best part of the hostel was how social it was, we really felt part of a community while we were there. From the staff asking how you slept and what your plans were, to sitting next to people at breakfast and tagging along on the free walking tour, it was a really friendly and cheerful atmosphere to be in. If you can, it is worth taking a free walking tour with these guys. Our tour guide (Vivianna) was amazing! She really knew her stuff about Madrid showing us the main sights as well as her own personal favourite spots, and really took her time walking us around (seriously she was late back to her shift at the hostel!). A couple of us from the tour even ended up having lunch together afterwards. Definitely check this place out if you want to make friends and thoroughly enjoy your stay, it’ll be money well spent! Free printing for boarding passes and transfers and free use of computers! 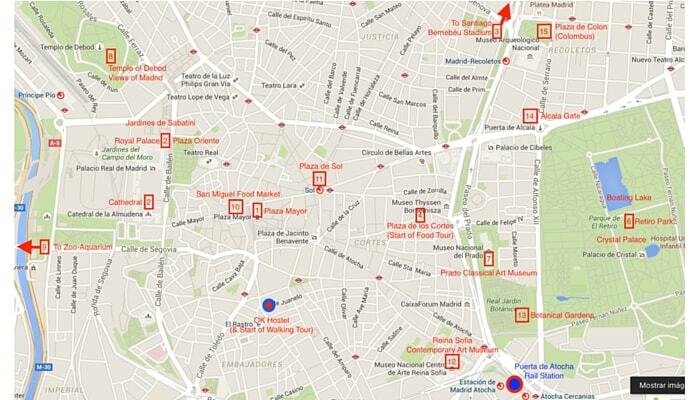 Closest Metro Stops: La Latina and Tirso de Molina. Budget: The Hat Madrid Hostel – from €15/night (Hostels range €9-40). It was strange getting used to the fact that almost everywhere in Madrid was good for food. Even if a restaurant was crazy cheap or didn’t look like a restaurant at all (this usually means a ‘dodgy’ place in the UK), the food is amazing. So don’t be afraid to try anywhere! 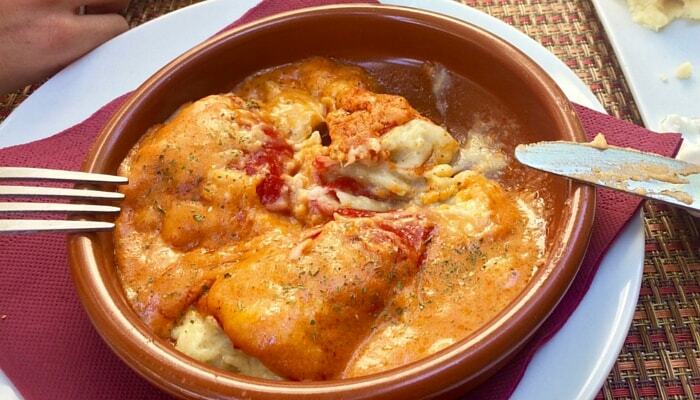 A lazy breakfast is a must in Spain so every single typical Spanish bar will be serving it and it will be good. Breakfast normally includes coffee with a tostada, pan con tomate (bread with tomato puree), tortilla or bocadillo (a sandwich). This may seem weird, but as breakfast is the most important meal of the day they like it to be substantial. Plus they have bread with everything! A later brunch would involve churros (light doughnuts) dipped in coffee or chocolate. The market of San Miguel is conveniently located just outside of Plaza Mayor and is packed full of people socializing with drinks and tapas. We went for lunch and tried a range of tapas from croquetas to mini crab burgers which were amazing. With everything more or less €1-2, it is the perfect place to expand your taste buds and sample every weird and wonderful thing. Wherever you are in Spain, you will come across a menú del día (‘menu of the day’). This is usually a three-course meal with a drink and bread included for €9-15 depending which region you are in. Make sure, if you want this menu, that you find a restaurant full of Spanish people! If you have to wait for a table even better! In these places, the food will be exceptional with each course as delicious as the next. In more touristy places, it can be very hit and miss. Usually, the food is nice but sometimes you might get what you paid for. Madrid wasn’t as costly as some people would think. They have cheap transport and you can walk and see almost everything for free! Accommodation – We stayed in a private double room but there are countless hostels available for €10-20 per night. Approximately €330 for a weekend. Sadly our Madrid city break was over but we couldn’t have enjoyed it more. 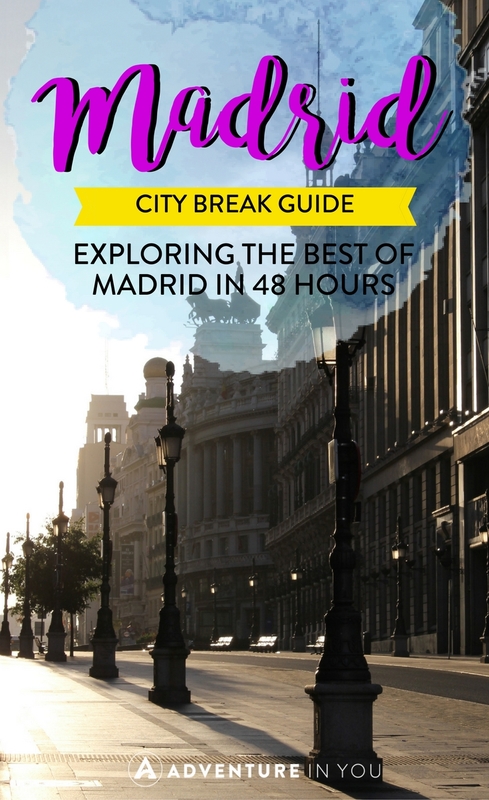 If you love city breaks as much as we do but like to see a city with a difference once in a while, then Madrid should be next on your list! If you’re carrying on exploring the rest of Spain, don’t forget to check out a few things to do in Barcelona. 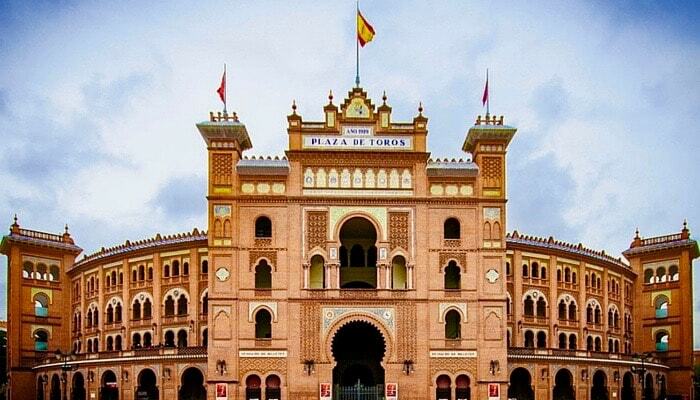 Does the Devour Tapas and Flamenco Tour include the tapas in the price? Yes! It includes full dinner (in three tapas places) as well as drinks!